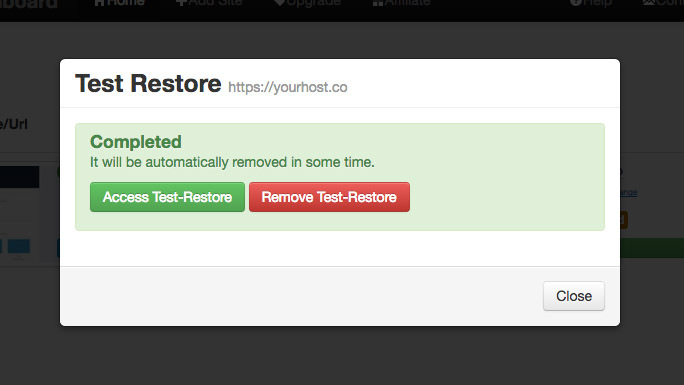 Test restoring a site can be useful to get a good overview on your latest backup and if it's missing any files. A Test-Restore is spinning up a new WordPress installation and deploying the backup that is on file on to that installation so you will have a 1:1 copy of your site on a different server to try out if everything is working or just make sure you have the right backup / most recent one on your BlogVault account. Test-Restoring is very simple. You press the Test-Restore button and once the process is completed you will get a popup message on how to access your site and an additional email with all the required credentials.